Your home's plumbing system has a variety of valves found at various points along the water pipes that allow you to turn off the water during emergencies or when you need to make repairs or upgrades. 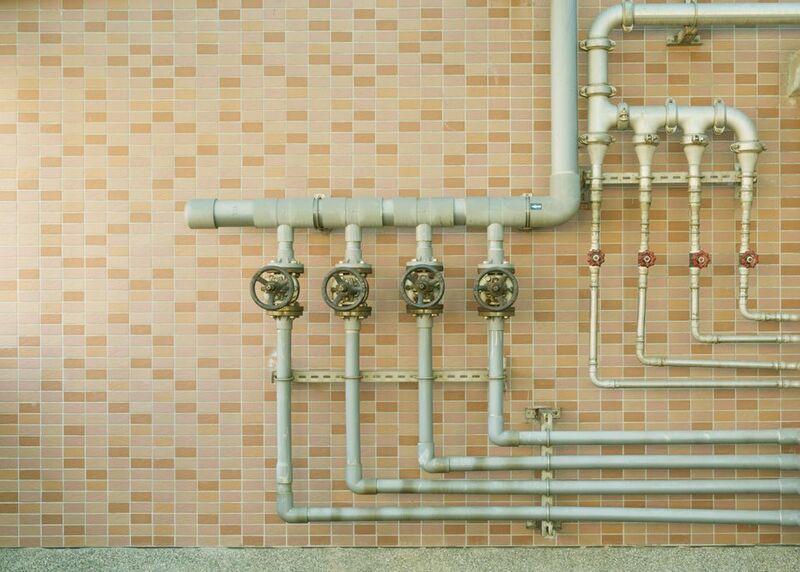 Shutting off the water is often the first step of many plumbing projects. Locating and turning off the appropriate water shut off valve is, therefore, very important. A ball valve is normally a rather large metal valve usually featuring a lever handle. It is designed for quick turn-off since the valve opens and closes full with a short 1/4 turn of the lever handle. This is the type of valve often seen at the main water shut-off for the home. You can usually recognize it because the body of the valve below the handle will have a bulbous section where the ball inside fits. The internal ball has a hole through the center of it. When the valve is open, the hole is aligned with the direction of the water pipe, allowing water flow. When the handle is closed, the ball rotates 90° so the hole in the ball is blocked. This is quite a common type of valve on main water pipes. A gate valve describes the mechanism by which the valve is opened and closed. To turn a gate valve on or off, a circular handle is turned to raise or lowers a metal gate inside the valve body. When the valve is off the gate blocks the flow of water. Like the ball valve, the gate valve is an all-or-nothing valve, designed to either allow full flow, or shut it off completely. Also, like the ball valve, a gate valve is a large metal valve. Gate valves are somewhat unusual in residential plumbing and are more common in industrial applications. But you may find one controlling your main water pipe or on another major water pipe. Sometimes they are found on the pipe leading to a hot water boiler. From the outside, a globe valve resembles a ball valve, with a slightly bulbous metal body. However, unlike a ball valve, a globe valve is designed to allow variable adjustment of water flow. Inside the valve, there is a baffle with a water flow port running through it The handle operates a plunger with some sort of washer or seal on the bottom; as the handle closes the valve, the plunger moves down against the water-flow port and partially closes it off. When the handle is operated, you can often feel the plunger tighten down inside the valve. A globe valve is used in situations where the flow of water may need to be controlled in a variable manner. This type of valve is often found controlling pipes that lead outdoors to water spigots, but also may be found anywhere a branch of the plumbing line has a shut-off. Individual fixtures all should have some form in individual shut-off valves that control water to only those fixtures. This allows water to be shut off for small repairs or replacements to the fixture itself without interrupting water flow to other areas. These fixture shut-off valves can take many appearances, but one that is very common is a small silver-colored valve with an oval handle with ribbed edges for gripping. Internally, these valves may use compression stem (you will feel a "squeeze" when closing the valve), but more common these days is a style that uses a small ball inside. With these, a short 1/4 turn of the handle turns the valve from fully open to fully shut. Fixture shut-off valves are available in styles that can be soldered onto copper pipes or solvent-glued onto plastic pipes, but more common are compression fittings that slip over the pipe and are tightened down in place. The first variation is an angled fixture shut-off, designed for when a water pipe comes out of the wall then needs to angle straight upward to feel supply tubes running to tailpieces on a sink faucet or toilet valve. You likely will have quite a number of these valves in your home. A close relative of the angled fixture shut-off is a straight shut-off which operates exactly the same way but is intended for use where the water flow can run straight to the fixture. It's very often used where a water pipe comes up out of the floor rather than out from the wall. A stop and waste valve is a key irrigation fitting to help keep sprinkler lines free from freezing in the winter. The stop and waste valve is turned on and off with a meter key and when it is in the off position it will automatically drain any water in the line.